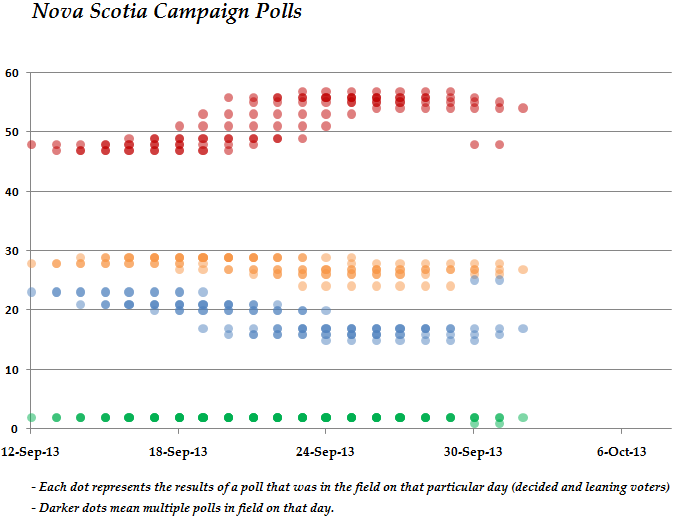 The election in Nova Scotia will be held in only a few days' time and the polling has heated up. The rolling Chronicle Herald/Corporate Research Associates poll will conclude with a final report on the weekend, while the new Sun News Network/Abacus Data poll will run right up until the end of the campaign. With two surveys now in the field, we can hone in a little closer on what is going on. Since the last major update last week, things have hardly budged. In the interim, however, the Liberals were flirting with an absolute landslide victory. Now, they just seem poised for a very comfortable majority. The projection model currently estimates Liberal support to fall between 48.9% and 56%, with the polls pointing more directly at 50.9%. That would translate into 35 seats for Stephen McNeil's Liberals, or a likely range of between 32 and 39 seats. The threshold for a majority government is 26 seats, and only an absolute worst case scenario currently points to the possibility of a Liberal minority. Darrel Dexter and the New Democrats are projected to be at 26.4%, with their likely range stretching to 29% of the vote. In terms of seats, they would likely win between 12 and 15 if an election were held today. The Progressive Conservatives have lifted themselves back out of the teens and now stand at 20.8%, or between 19.2% and 22.1% of the vote. This should give them between three and five seats, though if things go badly for the NDP there is an outside chance that Jamie Baillie could head up the Official Opposition. Polling in the campaign so far has been remarkably consistent, but there has been some movement primarily between the Liberals and Tories. The injection of the Abacus polling throws in a little uncertainty as well, as the firm has the Liberals lower and the PCs higher than CRA's estimates. Let's first take a look at the CH/CRA poll which, though stretching back further than the SNN/Abacus survey, does contain some newer information. But to put it in proper context, let's compare the latest tracking numbers to the last couple weeks. As you can see, the difference between CRA's latest numbers and the last completely independent sample is marginal. The only shifts, a gain of one point for the Liberals and a drop of two for the NDP, is well within the margin of error. But when also looking at the survey from early on in the campaign, a trend is a bit clearer. For the New Democrats, it is absolute stability: they have wobbled between 27% and 29% in CRA's three independent samples. The PCs have dropped significantly from 23% to 17% (a statistically significant decrease). The Liberals have been consistently increasing, from 48% to 53% and now 54%. The overall gain of six points during the campaign is within the margin of error, but only just. The new Abacus poll tells a similar story, but the details are slightly different. The poll gives the Liberals 48% support compared to 26% for the NDP and 25% for the Progressive Conservatives. In other words, it agrees with CRA that the Liberals hold a virtually insurmountable lead. They also agree that the NDP is in the mid-to-high 20s. But the big difference is, of course, the PCs at 25%. That is important for the party, as it is exactly where the Tories stood on election night in 2009. On the other hand, CRA is pointing to an all-time worst result. We will have to see if the final set of numbers from CRA shows an uptick that puts it more in line with Abacus's polling. It also has to be recalled that CRA is incorporating data in the field running back to September 26 in their latest poll, while Abacus has data just from September 30. So comparing the surveys is like comparing one bag of apples to another bag of apples that includes a few rotten ones. Abacus's extremely detailed report includes plenty of interesting information, including regional breakdowns. They show that the Liberals are leading throughout Nova Scotia, but that their advantage is less pronounced in Halifax. The details in the poll make it clear just how much of an advantage the Liberals have. They lead in all age groups, including those older voters most likely to head out to the polls, are seen as the likely winners by half of the population, and lead the NDP on important issues like jobs and the economy and health care. McNeil beat out Dexter and Baillie by a margin of 30% to 19% and 15% on the Best Premier question - a margin similar, though somewhat tighter, than CRA's - and he has a much better favourability rating. Fully 53% of Nova Scotians polled said they had a positive opinion of him, compared to 37% for Baillie and 35% for Dexter. Perhaps more importantly, he also had the lowest negative rating: 22% to 35% for Baillie and 45% for Dexter. Those are murderous numbers. Abacus is also calculating the voting intentions of who they consider likely voters. Among likely voters, Liberal support increases to 51% while the NDP stays at 26% and the PCs fall to 23%. Normally this is the kind of data I would prefer to use, but the samples are already very small and Abacus hasn't included regional breakdowns of likely support. So I will be sticking to the general-population numbers, but we should keep these calculations in mind. They point to the Liberals being able to out-perform their polls, while the PCs could under-shoot them. Both polls still show a large proportion of undecideds. CRA reports 15% undecided and 16% no response. That has been dropping, though. The proportion of undecideds was around 22% at the beginning of the campaign. Abacus showed a much larger 35% undecided (and an additional 5% no response), but that is not too dissimilar from the total 31% undecided/no response that CRA is showing in their latest poll. Yes, yes, British Columbia and Alberta have taught us all we'll ever need to know about prematurely calling a race. But both of those elections showed much closer gaps than the 22 and 27 point gaps that these two polls are showing. So we should be safe. Famous last words. As per my prediction of last week it appears the NS NDP is well on its way to third place-now only 1 point above the third place (for now) Tories. As someone who has lived in Nova Scotia it is my anecdotal opinion that support for the Tories or Grits have an absolute bottom of about 25% both federally and provincially. A similar pattern exists for the other Atlantic provinces save PEI. Except that today's new Abacus poll has NDP 28 PC 22 among committed likely voters and NDP 29 PC 22 among all committed voters. My own (very cautious) prediction is that we will see the same phenomenon that we've seen in now numerous Canadian elections in the past few years whereby voters, seemingly wary of change, end up supporting the incumbent government to a greater level than polls either before or during the election campaign suggested. We saw this in the 2011 federal election when polls showed CPC support dipping towards the end of the campaign but ended up being what early-campaign polls were showing; again in the Ontario election when pre- and early-campaign polls showed the LPO headed for defeat; again in the Alberta election when all polls showed the PCs headed for defeat; again in the Quebec election when most late-campaign polls showed the LPQ in third place and they ended up finishing very close second; and finally again in BC (you know the story). "Except that today's new Abacus poll has NDP 28 PC 22 among committed likely voters and NDP 29 PC 22 among all committed voters". However, we know NDP supporters vote less frequently than Liberal or Conservative voters primarily because NDP support is heavily concentrated among younger Canadians. About 1/10 18-34 year olds vote. If the trend continues in Nova Scotia the NDP will garner about 20% of the popular vote. The NDP is going down hard. Megan Leslie M.P. will be the new NS NDP leader by Spring (Nathan cullen will run for BC NDP leader and will not win). I stand by my prediction. I contend that like the UK the shy Tory phenomena exists in Canada; Tory supporters are less willing than others to list their preference. In the UK this is thought to diminsh the Conservative support 2-3% per poll.As you point out above a similar phenomenom took place during the 2011 general election. The BC election is a unique example since, it rests on a policy turn around by the NDP and turnout which was not properly gauged by pollsters. I agree there is circumstantial evidence for this "trend of cautious incumbent government voting", however, I would be cautious with the BC example since, it rests on a very specific policy position and geographic area. Éric, I see you're still favouring Abacus' "all committed voters" results over their "committed likely voters" results despite today's larger sample size. Will you keep doing this? I'm just curious what your rationale is because I've been debating what to enter into NS election Wiki page; so far I've gone with the likely voters. I will probably stick with the 'all committed voters'. Why? - Samples are still very small - just 342 likely voters with Abacus's latest poll, compared to 447 committed voters. - While Abacus is releasing a lot of information, they do not have a regional breakdown of likely voter support. Though I haven't been showing this information, the model is making regionally-based projections and I prefer using the data I have rather than estimate regional breakdowns from the province-wide likely voter results. - Abacus itself is focusing on committed voters rather than likely voters. - At this point, the numbers are hardly different so it is not worth the issues listed above. If Abacus's likely voter numbers were radically different from their committed voter results, though, I'd probably re-consider. Good points. Thanks for sharing.